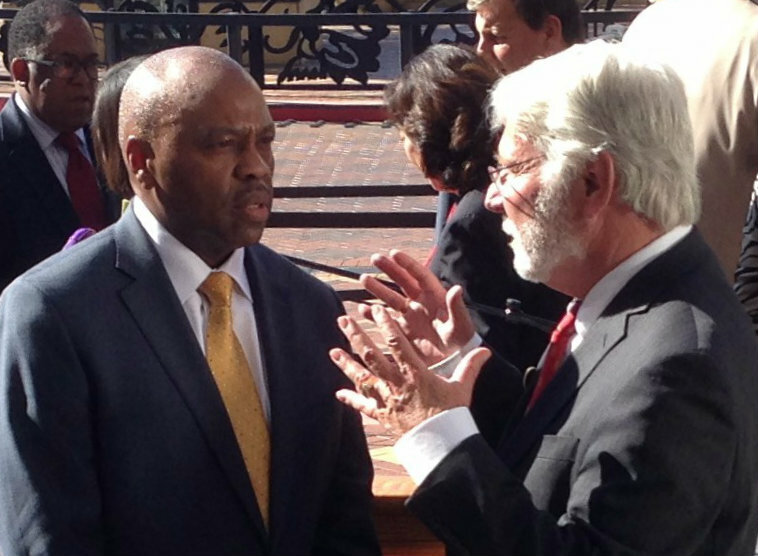 Incoming Metro CEO Phil Washington (left) speaking with outgoing Metro CEO Art Leahy after this morning’s announcement. Photo: Joe Linton/Streetsblog L.A.
Metro’s board established quorum, then entered a closed session to discuss the CEO personnel matter. The board returned to open session where Metro board chair, and Los Angeles mayor, Eric Garcetti enthusiastically moved to hire Washington. The motion was quickly seconded by all the directors present and passed unanimously. Washington will earn a $326,000 annual salary, and will begin in May. The board meeting was followed by a press event at Patsaouras Plaza. Garcetti and the Metro board vice chairs, County Supervisor Mark Ridley-Thomas and city of Duarte Councilmember John Fasana, all praised Washington’s experience and reputation. Garcetti emphasized that Washington had increased ridership, created jobs, and delivered Denver’s rail connection with their airport. Directors also thanked outgoing CEO Art Leahy for his service to the agency. Phil Washington thanked the board, then opened emphasizing that he rides his transit system every day. “This is our product,” he continued, emphasizing that transit officials need to ride to “know how it’s doing.” Washington stated that his priority would be a “clean, efficient, reliable, accessible, and cost-effective system” and his first order of business would be better understand what Metro’s board and Metro’s “customers – riders” want and need. He stressed that transit infrastructure can and will continue to transform the region. Washington repeatedly emphasized partnerships, including with other agencies, the private sector, academia, community groups, and whoever would work with his agency. Washington makes a good sized step up from Denver RTD. According to APTA, RTD’s overall 2014 ridership was 105 million trips, about 30 percent of Metro’s 353 million trips. RTD riders break down similarly to Metro’s with about three-quarters of trips on bus, and roughly one-quarter by rail. Washington oversaw Denver RTD’s implementation of FasTracks, an ambitious voter-approved capital expansion program, including 122 miles of new rail service, 18 miles of bus rapid transit, redevelopment of Denver’s Union Station, plus plenty of park-and-ride lots. Denver livability advocates, from Transit Alliance, Walk Denver, and Bike Denver, all gave Washington high marks, and expressed disappointment in his leaving. Walk Denver acting board chair Gideon Berger, fellowship director at the Urban Land Institute’s Rose Center for Public Leadership, worked with Washington at RTD. Berger describes Washington as “a breath of fresh air” for having taken the reins at RTD during the fiscal challenge of the recent recession. According to Berger, Phil Washington was instrumental in increasing the morale of RTD staff, empowering them, and ensuring they had the resources to be successful. This theme of regional collaboration echoes Garcetti who states frequently, he is not just the mayor of the city of Los Angeles, but does his part for the entire region. One for example is Garcetti’s office working to keep rail manufacturing jobs in Palmdale. According to Berger, Phil Washington stressed that his Denver RTD was responsible not only for the T, but also “a better O and part of D.” Further, Waggett states that, instead of TOD, Washington prefers the acronym “TOC” for “Transit-Oriented Communities,” stressing transit’s ability to re-shape, re-orient, and re-develop. Berger listed how Washington supported Denver TOD in multiple ways, especially in learning from past mistakes. Washington put the right staff in charge, gave them resources to put deals together, revamped joint development processes and procurement solicitations, collaborated with cities and agencies, and connected with private partners who had the right experience to make projects a success. Under Washington’s leadership, RTD brought its real estate assets, generally park-and-ride lots, to bear to make joint development happen. Wagget is one of those private partners currently developing the Alameda Station Pilot Project. Many of RTD’s new stations are located in former industrial areas. As throughout the L.A. region, prevailing plans dictated car-centric development, even as transit stations were being planned and built. Waggett describes the Alameda Station project site as a light rail station sited between a K-mart loading dock and a park-and-ride lot. Opening in mid-2015, the new LEED platinum Alameda Station TOD, called Denizen, will be 275 units of housing, apartments and townhomes. Berger cites additional Washington RTD success in jointly developing Olde Town Arvada. It is mixed-use housing being developed by Trammel Crow Company, as its adjacent rail line is being constructed. While much of Denver’s TOD has been market-rate, Washington appears to have had his hand in mechanisms in place to foster affordable housing. Unfortunately we were unable to get a statement from Mile High Connects, the non-profit at the forefront of efforts to foster transit equity in Denver. Mile High Connects oversees Denver TOD affordability tools including the Denver Regional Transit-Oriented Housing Fund, preservation of existing near-transit affordable housing, development of new affordable housing, and more. While none of the folks with whom we spoke cited any direct Phil Washington involvement in implementation of specific bicycle or pedestrian projects, under his stewardship, RTD’s TODs have emphasized walkability. The developments include features that enable car-free and car-light living, including bike share stations, bike parking, and car sharing. Waggett and Berger emphasize that these features do not come standard in the Front Range municipalities. Transit and walk orientation fly in the face of prevailing development norms that pervade that region, not unlike the new region that Washington will soon call home. Berger stated that Washington’s public private partnership record has stressed that the public agencies work with communities to set the agenda, then private partners are brought in to get the public’s vision implemented. Phil Washington faces a number of challenges when he assumes office this May. Metro’s ambitious rail construction program means improved rail transit, but also a “structural budget deficit” that sets the agency up for increased fares, likely to lead to declining ridership. Metro has seen some success on TOD, with Garcetti pushing for more, but the agency’s joint development processes are, at best, relatively limited and slow-paced. At their worst, they are wrongheaded and controversial. SBLA welcomes Phil Washington. We look forward to his tenure at Metro repeating, and hopefully even surpassing, his Denver track record of sustained success. Phil Washington has a very powerful personal story that he openly shares about his own experiences that inform his perspective about social equity. In Denver, we have a growing and strong movement of advocates concerned about and organized around equity issues, both from the perspective of development occurring around our transit stations and around the accessibility of transit through affordable bus and light rail fares and passes, meaningful bus service routes for lower-income communities and communities of color and physical access to stations around first and last mile connection barriers. I hope that Phil will be a good ally to the great work of communities and advocates across L.A. around social equity issues. I am walking up Denver’s 16th Street Mall about 6 p.m. the other day and who should I bump into but Denver RTD General Manager Phil Washington. He was headed the other way making his daily commute. He walks six blocks to the light rail stop at Union Station where he boards a train for his home stop. He rides his system every day to and from work. Typical Phil Washington: practice what you preach. Lucky Los Angeles! We all knew Phil Washington would be headed for a bigger system sooner rather than later. He really is that good. He is especially suited for L.A. where you are building out your complex transit system. This is his forte, I think, a determined, “we can do this!” kind of guy. He is measured, even tempered with a firmness that probably comes from some combination of his south Chicago youth and military career. At the same time he is personable and pays attention to folks on the job or on the street. As for sustainability, the system he has worked on for some sixteen years reflects and attempts to accommodate all modes. Its problems stem from Denver’s love affair with the auto at the expense of other modes for the past 60 years. In his keynote address at ColoRails 25th anniversary meeting last Fall he painted a vision that certainly championed a sustainable, millennial approach for Denver’s transit future. His emphasis was on rekindling federal financial support to support regional and local transportation systems. Resources and management are where his head is at, I think. He accommodates advocates and has never claimed to my knowledge that he has all the answers. Looks like Leahy is explaining the “structural budget deficit” Washington is inheriting. My favorite line from the story: “Phil Washington… rides his transit system every day. ‘This is our product,’ he continued, emphasizing that transit officials need to ride to “know how it’s doing.” Amen. Or the fact that the Denver-area has one agency for 12 counties while Los Angeles County has multiple agencies (with differing fares) operated by multiple cities? Just out of curiosity, who won the Streetsblog readers’ poll for Metro CEO? I recall voting for Mr Washington, but I don’t think he won. Who did? Truth be told, Metro fares need to increase. Many Board Members don’t want to be faced with that fact, despite findings from a Peer Review. Metro has their Blue Ribbon Committee hard at work figuring out what services can he trimmed or reduced. Right now, try to figure out how to get to a early shift manufacturing, restaurant or telemarketing job in the San Fernando Valley that starts at 6, 6:30 or 7 a.m. The problem is that mostly you can’t weekdays and almost never on weekends. It will be interesting to see how Phil guides his Board to get to goal. Joe: Good job tracking down the Denver locals. Phil was brought in because of his financial skills in getting impossible projects funded and getting them delivered on time. Eric seems to be doing a good job finding managers. We will see how Bonin deals with the fare increase now. LA is getting one heck of a CEO for its transit agency. As an RTD Board member that worked with Phil for the past 6 years, I have seen Phil take the Denver agency from a desperate situation to an organization with many high profile successes. When I started on the Board, there was little hope of building much of anything related to FasTracks. The national economy had tanked and we went through a nasty Legislative Audit centered around the previous CEO. Phil has totally turned the Denver agency around making the Denver RTD stronger and much more responsive to the needs of the region. We have much to do out here and it starts with finding a new, high quality CEO. Your gain is our loss. I wish LA and Phil the best of luck and success in your future transit / multi-modal endeavors. Metro is deciding several rail construction issues: budget increases for Crenshaw/LAX and Regional Connector, contract for Purple Line Extension phase 2, and possible future Arts District service.